With billions of dollars being spent on cancer research there is yet be declared any clearly proven measure to prevent cancer. Nor is there any proven cure once cancer is diagnosed. So the news headline that resveratrol (a red wine molecule) and genistein (a molecule found in soybeans) may be unique and promising anti-cancer agents is striking given all the money that is spent to develop synthetic anti-cancer drugs. The problem is — I am not talking about the most recent scientific report about these molecules which says resveratrol and genistein are cancer-killing molecules that do not harm the DNA in healthy cells and are far less problematic than existing chemotherapy drugs, but about a similar report issued over a decade ago! Nearly a decade ago pioneer researcher John M Pezzuto said, in regard to resveratrol, that “preclinical toxicity studies are underway that should be followed by human clinical trials. Imagine, resveratrol blocks cancer at all three stages of development – initiation, growth and spread (metastasis) – something no anti-cancer drug can do, yet there are few if any human clinical trials. Resveratrol is better known as a molecule for the heart given that it is found in concentrated form in red wine which is known to reduce the risk for coronary heart disease mortality. But again, an Ivy League University researcher laments that after all the talk about resveratrol in wine and heart disease there is not yet one human clinical trial involving this molecule for heart problems. Moreover, resveratrol was shown to overcome drug resistance and could be used in parallel fashion with chemotherapy drugs. With all of these proposed benefits, one would think oncologists would begin employing resveratrol at least on grounds of compassionate care, given that all other proven anti-cancer drugs have been exhausted without tumor remission. But no, oncologists will say resveratrol is unproven and there is no data on safety or effectiveness as yet. But this begs the question. Chemotherapy drugs have already been disproven. Drug-resistance sets in every time. Resveratrol is in the superior position because it has not been ruled out as yet. Why not use it? National Institutes of Health researchers call for a re-evaluation of its safety given that a mega-dose of resveratrol (5000 mg) among terminal cancer patients with multiple myeloma induced kidney failure and forced termination of the study. However, there is more known about resveratrol than researchers recognize. I provide the content of a recent e-mail sent to the lead researcher at the National Institutes of Health, providing information he is likely to be unaware of. The letter is a bit technical in nature. If you choose not to wade through it, it says we already have an available resveratrol pill that is not toxic to the kidneys even in high dose and it works by a different mechanism — not toxically killing cancer cells but starving them via inhibition of newly formed blood vessels that supply growing tumors with nutrients. This has been clearly demonstrated in gene studies and in humans in the clinic using a certain brand of resveratrol pill that provides only 100 milligrams of resveratrol. This pill supercharges resveratrol by combining it with other synergistic molecules. Synergism is multiplying its effects, not just adding to its biological action. In one study, this brand of resveratrol pill activated 9-fold more genes than plain resveratrol at a comparatively low dose. It is indeed a wonderful to contemplate a day when cancer-cell killing therapies could be employed via natural molecules like resveratrol without the drawback of toxicity to healthy tissues or the unwelcome occurrence of tumor resistance. At the very end of your paper published in The Proceedings Of The National Academy of Sciences you called for (a) re-evaluation of the safety of molecules like resveratrol leading to (b) more efficient use of antioxidants for chemotherapy and (c) public caution till safety and effectiveness is proven. However, more is known about resveratrol and cancer than most cancer researchers realize. I might say that modern medicine has attempted to view resveratrol much too narrowly as it exerts multiple biological action against cancer, such as (1) anti-angiogenesis (inhibition of new blood vessels that then starves tumors); (2) anti-blood clotting to prevent metastasis (spread of cancer); (3) anti-adhesion properties (for the same reason); (4) anti-inflammation via inhibition of Cox-2, TNF1 and C-reactive protein); (5) facilitation of DNA repair; (6) metal chelation (thus minimizing metals as tumor growth factors), and (7) genetic factors such as inhibition of hypoxia-inducing factor (HIF-1) that triggers an oxygen-deprived environment in which tumors thrive. The mechanism your paper refers to is cytotoxicity, or cancer-cell killing. In this regard, it is widely known that resveratrol is an antioxidant at low-dose concentration and a pro-oxidant at high-dose concentration. At high dose concentration resveratrol releases copper to generate free radicals while at low dose concentration it binds to copper and prevents oxidation. Your paper frequently refers to resveratrol as an antioxidant, but in high-dose concentration it promotes oxidation. This pro-oxidant action is the sole direction of current resveratrol research for cancer. As you are likely aware, a mega-dose (5000 mg) course of resveratrol therapy was attempted (unpublished) among terminal multiple myeloma patients which resulted in rapid kidney failure and cessation of the study. Resveratrol is a biological stressor that the human body wants to excrete in large doses and shuttles it to the kidneys for rapid elimination. But it obviously reaches high concentration in the kidneys and likely releases copper and generates copper-induced toxicity. However, I think that the other non-toxic/ non-oxidizing properties of resveratrol can be directed towards cancer prevention and therapy, namely the seven listed above. The question is which of these measures is the most important, if any? In that regard, I call your attention to microRNA-21. Just the control of a single microRNA, microRNA-21, would likely make a profound difference in human health. MicroRNA-21 has been identified as the only microRNA over-expressed in a wide variety of cancers. Another closely related microRNA, microRNA-20b exerts control over two key genes involved in cancer – the hypoxia-inducing gene (HIF-1) which produces the oxygen-less (ischemic) state that is characteristic of tumor cells (as first discovered by two-time Nobel Prize winner Otto Warburg in the 1930s), and the gene that activates new blood vessels (neovascularization or angiogenesis) that feeds nutrients to solid tumors. Control of these two genes is considered key to controlling cancer. If healthy cells lose their ability to adapt to varying oxygen concentration, they become cancerous and revert to making sugar, then utilize it for cellular energy rather than oxygen. The number of natural molecules that have been tested for their ability to influence microRNA is limited. Green tea extract was tested for its impact upon microRNA among human breast cancer cells. Twenty-three genes were significantly differentiated, up to 3.8 fold, by green tea extract at a low concentration, particularly microRNA-21. Green tea extract exerts a significant though modest influence (1.18 fold change) over the tumor suppressor gene known as tropomyosin-1 via microRNA-21. Below is a chart showing the microRNA profile for green tea extract upon human breast cancer cells. Green tea consumption is associated with a reduced risk for breast cancer. If the cancer-cell-killing (cytotoxic) effect of a specific microRNA, like microRNAs-20b or 21, can be magnified, it is conceivable that treatments targeting over-expressed microRNAs can be developed, say geneticists. Such a development may already have been measured. Resveratrol has already undergone microRNA analysis by researchers at the National Institutes of Health. Researchers also compared plain resveratrol with a commercially available resveratrol-based, multi-small molecule nutriceutical (Longevinex®). This is a product that I formulated. 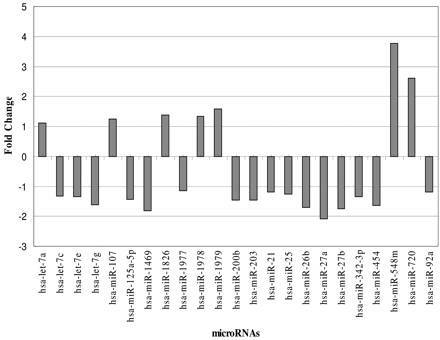 * 3.8-fold change was the peak microRNA change exerted by green tea extract in another study. Both resveratrol and a resveratrol-based nutriceutical featuring multiple small natural molecules, exceeded the effect of green tea in over 20 different microRNAs. So you can readily see that there may be nutriceuticals that are already available that have a profound effect over key microRNAs involved in cancer. Furthermore, Longevinex® has been subjected to mega-dose and recommended-dose toxicity analysis in animal and human kidneys respectively and exhibited no toxicity. Again, Longevinex® was employed in rodent heart in mega-doses (~2800 mg human equivalent dose) and did not exert cytotoxicity, whereas resveratrol did. We assert there is sufficient data available to show that a unique resveratrol-based nutriceutical is fit for initial human trials, at least when all other therapies have been exhausted, and it can be employed on a compassionate-use basis. The problem here is that the FDA demands a New Drug Application before human trials can begin and Longevinex® is not a drug. The only way Longevinex® can proceed with human testing is if the measurable parameters of a study are confined to structure and function end points, i.e. “supports healthy gene expression,” or “supports healthy angiogenesis,” or “promotes markers of inflammation within the healthy range,” etc. I should add that Longevinex® has been used by thousands of consumers for a period of 8+ years without notable side effects. Caveats are given for those subjects who are anemic. Furthermore, Longevinex® has been utilized in a human pilot study of patients with wet macular degeneration and has rapidly resolved more than 90% of neovascular membranes at the back of the eyes with no side effects (soon to be published). Obviously, wet macular degeneration serves as a model for anti-angiogenic cancer therapy. Delay in utilizing resveratrol for any stage of cancer is appalling given that modern medicine has no cures or preventives for malignancies. Most cancer researchers prefer to develop more potent but possibly more toxic synthetic analogs of resveratrol which are more commercially profitable. But the ethics of further delay in light of an existing nutriceutical which already has a proven track record of safety and known mechanisms of action would be unconscionable. We trust the NIH will proceed forward to put resveratrol to the test. Attempting to go the route of a drug trial will only further delay initial human clinical trials, possibly end up costing many hundreds of thousands of lives, and may result in the same toxicity experienced among multiple myeloma patients without the built-in safety that Longevinex® has already demonstrated. Additionally, desperate cancer patients are reading about your work and some are likely to proceed in the unguided use of resveratrol. This provides more impetus for the NIH to proceed ahead in a timely manner. I trust you will give my letter sincere consideration and share it among your colleagues.